The above Office action was filed on Monday, December 3. Once again, a first Office action tentatively invalidating a patent comes shortly after an infringement finding against Samsung: in late October a preliminary ruling by an ITC judge deemed this patent valid and held Samsung to infringe it (as well as three other patents). The ITC staff supports the judge's initial determination. The touchscreen heuristics '949 patent has also been asserted against Motorola. Judge Posner declared large parts of the patent invalid and identified only some minor potential infringement on Motorola's part that he decided would not warrant injunctive relief even if Apple prevailed on whatever little was left of its related claims. In the build-up to the ultimately canceled trial, Judge Posner had barred Apple from referring to the '949 patent as "the [Steve] Jobs patent". Steve Jobs is the first named inventor (of many) of this patent. Many of his 300+ patents are design patents, but among software patents, the '949 patent is probably the most famous one. The USPTO held an exhibition relating to Steve Jobs's patents, but now it's apparently having second thoughts about the most prominent one of them. Back in 2010 a reexamination request against the '949 patent was denied by the USPTO. 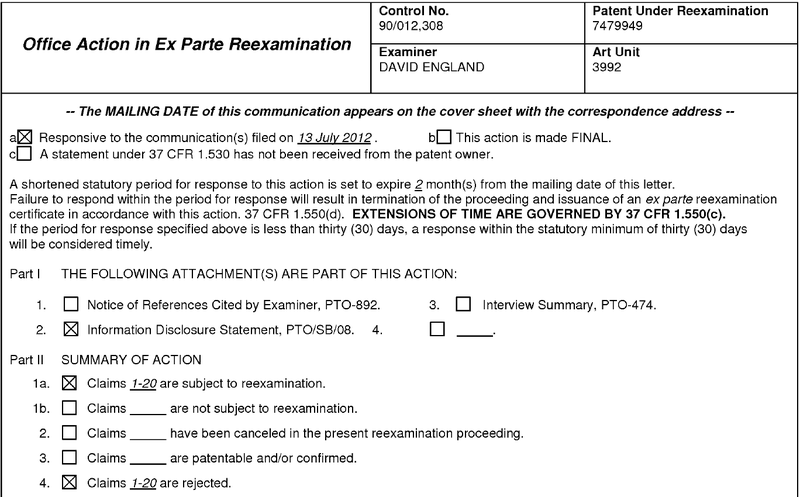 But another request resulted in the opening of a reexam proceeding, and the preliminary result is that the patent is deemed invalid in its entirety. I have said on various occasions that first Office actions and other non-final Office actions are just preliminary. 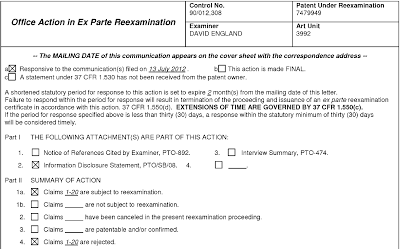 Many patent claims that are rejected at this stage do ultimately survive. There are many steps inside the USPTO, followed by a potential appeal to the Federal Circuit (and in a few cases even the Supreme Court). Some people say that first Office actions are partial because they are based only on submissions made by those challenging the patent, and many examiners like to take a tough position early on in order to enable and require the patentee to present the strongest arguments in favor of validity. But it would be a mistake to underestimate the significance of a first Office action. Also, a complete rejection of all claims of a given patent is potentially more devastating than one affecting only some claims. Should the first Office actions tentatively invalidating the rubber-banding and the touchscreen heuristics patents be affirmed at the end of the proceedings (after all appeals have been exhausted), Apple would lose two iconic patents, but it would still have thousands of other patents, including hundreds of multitouch patents. If you've previously read my comments on the '949 patent, you may have noticed that I never liked it because it seeks to monopolize the right to solve a problem as opposed to a specific solution. My position on the rubber-banding ('381) patent is more nuanced. It's psychologically brilliant and represents outside-of-the-box thinking even though its implementation is utterly trivial from a technological point of view.